Where to Buy Solo Handheld Sprayer, Solo 418 Handheld Sprayer - Liter - $19.95 for Sale with Fast Free Shipping! 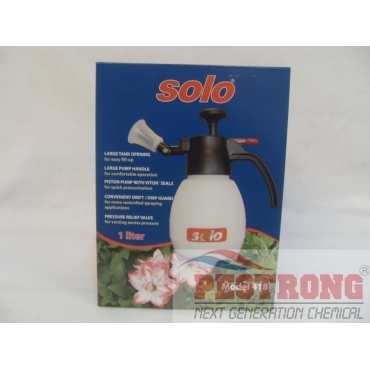 Solo 418 Handheld Sprayer - Liter is professional sprayer for virtually every spraying requirement. Triple Action Neem Oil Insecticide.. This unique, one hand sprayer incorporates all the easy pump, easy fill, easy clean-up characteristics found on Solo sprayers. Features a unique fully adjustable nozzle, a drip/drift guard and a hinged, multidirectional wand assembly. With durable components and Viton seals, repair and maintenance is easier than ever. What an awesome little sprayer (well little compared to my big ones)! This is a compact sprayer, but it hold enough in its tank to get the small jobs done. And the size allows it to be stored is smaller spaces, get cleaned easier, and it's not bulky and hard to walk around with, compared to the big ones, and even some smaller ones too. It has a nice and even spray that will guarantee a consistent application. And the cone is amazing. Such a simple thing, but it works so well. It allows for a more focused spray and it tilts too, to get the best spray contact as possible.